Derek Curran was suspended from Castlebrae Community High School following inquiry into former pupil's claims about a member of staff. A head teacher brought in to improve an Edinburgh high school has been sacked following an investigation into his conduct. Derek Curran was suspended last year from Castlebrae Community High School following an inquiry into a former pupil's allegations about a member of his staff. It is understood Mr Curran did not act swiftly enough to those complaints, which is believed to be one reason that contributed to his dismissal. A spokeswoman for the council said: "I can confirm that Mr Curran is no longer employed by the council." Norma Prentice, who has been acting head teacher in Mr Curran's absence, will continue in the role on a permanent basis. 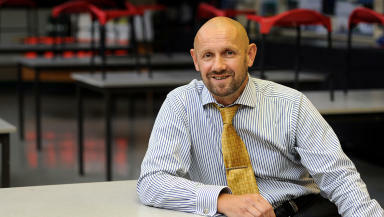 Mr Curran started his job at the school in June 2013. The school has struggled with exam results in the past, with just 12 pupils achieving one or two Highers in last year’s results. In 2013 it was saved from closure after a campaign by parents. Council officials had wanted to shut the school because of its low roll and poor attainment.